Make your stay in Toulouse a true delight! 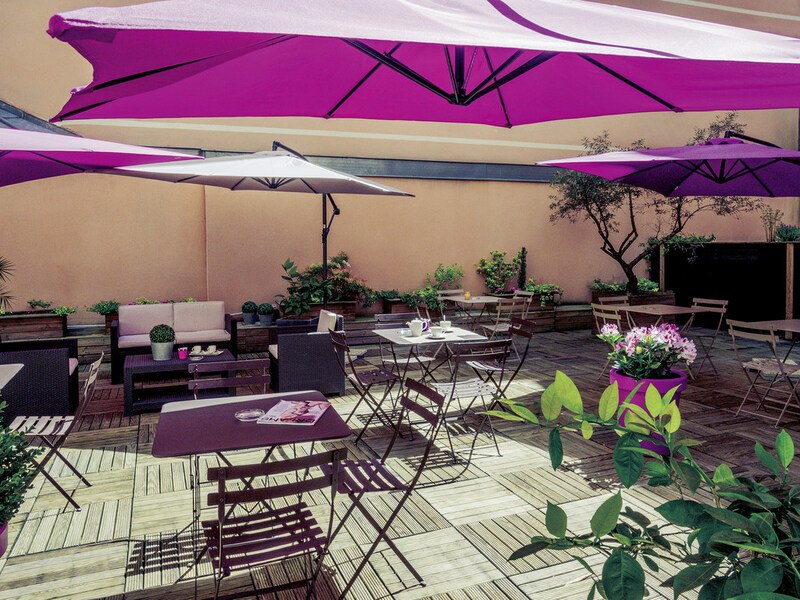 In the heart of the city center, the Mercure Toulouse Centre Wilson Capitole hotel is ideally located for discovering the city and its secrets. We look forward to welcoming you to this calm and tranquil hotel. An example of characteristic Toulouse architecture, the 4-star Mercure Toulouse Centre Wilson Capitole hotel is a beautiful red-brick building in downtown Toulouse, with good metro links to the train station and the conference center. Enjoy fully equipped rooms, some with balconies. In the evening, relax in the lounge bar of the hotel or take advantage of being close to the city center. The hotel is close to Place du Capitole, Place Wilson and Jean-Jaurès metro stop. You'll love the location of the Mercure Toulouse Centre Wilson Capitole hotel in Toulouse city center, close to restaurants, the theater and tourist sites such as Place Wilson, Place du Capitole and the Basilica of Saint-Sernin. Take a cruise on the Canal du Midi, or discover the Occitania region by bus, from Carcassonne to Albi, all in a day. The whole team is at your disposal to tell you about Toulouse's must-see sights. Choose from one of our Standard Rooms with double or twin beds or Club Rooms with more space. Or why not try our Junior Suites, spacious with a sitting area and sofa. Share a moment of relaxation in the cozy and intimate atmosphere of our bar lounge from 6:30am to midnight. Discover Mercure's selection of fine wines selected by our sommelier as well as a wide range of other beverages. Dear Hendradjaja H., We very much appreciate your comments regarding your stay at the Hôtel Mercure Toulouse Centre Wilson Capitole. It is always a pleasure to receive positive feedback. I will share your comments with our team. I am sure that this feedback will serve as an encouragement to all of our staff as we strive to continuously improve the quality of our services. Thank you again for sharing your experience, and we hope your next visit will be as pleasant as the previous one. Sincerely, Valérie Moirod General Manager. Was on an overnight stopover in Toulouse and wanted somewhere central to stay and knew the area so selected the Mercury Wilson .the stay was excellent the Hotel was as described. Plus was as I believed to be well placed for the Metro and some great restaurants very nearby. Dear client, We thank you very much for your evaluation ! We are delighted to hear that you liked the hotel and its location. As you pointed out, The Mercure Wilson is ideally located in the heart of Toulouse. A big thank you for your compliments on our staff ! We are always available to our customers to make their stay as pleasant as possible. Dear Guest, Thank you for taking the time to tell us about your experience at the Hôtel Mercure Toulouse Centre Wilson Capitole. I am sorry that your experience did not meet your expectations; please allow me to express my sincerest apologies. At Mercure, we strive to provide a superior service experience for every customer; therefore your feedback is very important to us. Please rest assured that we are taking the appropriate measures to address the problem and prevent future occurrence. Upgrade in a privilege room is linked to availability. Unfortunately, we didn't have the possibility to upgrade and all the amenities you've mentionned are only available in the privilege room, sorry. We appreciate your sharing your concerns, and it is our hope that you will give us the opportunity to better serve you in the near future. Sincerely, Valérie Moirod General Manager. Dear Lucas E., Thank you for taking the time to tell us about your experience at the Hôtel Mercure Toulouse Centre Wilson Capitole. I am sorry that your experience did not meet your expectations; please allow me to express my sincerest apologies. At Mercure, we strive to provide a superior service experience for every customer; therefore your feedback is very important to us. Please rest assured that we are taking the appropriate measures to address the problem and prevent future occurrence. We appreciate your sharing your concerns, and it is our hope that you will give us the opportunity to better serve you in the near future. Sincerely, Valérie Moirod General Manager. Dear Lincoln h., We very much appreciate your comments regarding your stay at the Hôtel Mercure Toulouse Centre Wilson Capitole. It is always a pleasure to receive positive feedback. I will share your comments with our team. I am sure that this feedback will serve as an encouragement to all of our staff as we strive to continuously improve the quality of our services. Thank you again for sharing your experience, and we hope your next visit will be as pleasant as the previous one. Sincerely, Valérie Moirod General Manager. Hotel was as expected rooms a little small. Dear Mr T., We very much appreciate your comments regarding your stay at the Hôtel Mercure Toulouse Centre Wilson Capitole. It is always a pleasure to receive positive feedback. I will share your comments with our team. I am sure that this feedback will serve as an encouragement to all of our staff as we strive to continuously improve the quality of our services. Thank you again for sharing your experience, and we hope your next visit will be as pleasant as the previous one. Sincerely, Valérie Moirod General Manager. Room clean, good service. Breakfast in line with the hotel level. Perhaps in other similar Accor hotels there is more extensive choose of food, but anyway the quality is good. Clean Hotel with very friendly staff however my room was very hot despite turing the AC down to 15 and the breakfast room was overly crowded and not well re-stocked. We enjoyed our stay at the hotel. The location, breakfast and staff were all excellent. The car park was a small space but just about manageable! The main downside was the air conditioning which was really not effective, the room was very hot and it was only March. Other smaller negatives points were that the room was a bit small and the “free minibar” had only water and soft drinks (no snacks or alcohol). Dear Guest, Thank you for taking the time to tell us about your experience at the Hôtel Mercure Toulouse Centre Wilson Capitole. I am sorry that your experience did not meet your expectations; please allow me to express my sincerest apologies. At Mercure, we strive to provide a superior service experience for every customer; therefore your feedback is very important to us. Please rest assured that we are taking the appropriate measures to address the problem and prevent future occurrence. Regarding your comment about air conditionning, we just would like to inform you that it is not on yet. In fact beacause of the outside temperature at night the system is still producing heat. Neverthless you have the possibility to switch it off into the room. We appreciate your sharing your concerns, and it is our hope that you will give us the opportunity to better serve you in the near future. Sincerely, Valérie Moirod General Manager. I enjoyed the hotel, its facilities and its very central location. Dear Alan S., We very much appreciate your comments regarding your stay at the Hôtel Mercure Toulouse Centre Wilson Capitole. It is always a pleasure to receive positive feedback. I will share your comments with our team. I am sure that this feedback will serve as an encouragement to all of our staff as we strive to continuously improve the quality of our services. Thank you again for sharing your experience, and we hope your next visit will be as pleasant as the previous one. Sincerely, Valérie Moirod General Manager. I have stayed at the Hotel Mercure Centre Wilson Toulouse for a couple of years. The hotel is still very good. ( Rooms and décor fresh and modern ). Great location to explorer the city from at night. Dear Guest, We very much appreciate your comments regarding your stay at the Hôtel Mercure Toulouse Centre Wilson Capitole. It is always a pleasure to receive positive feedback. I will share your comments with our team. I am sure that this feedback will serve as an encouragement to all of our staff as we strive to continuously improve the quality of our services. Thank you again for sharing your experience, and we hope your next visit will be as pleasant as the previous one. Sincerely, Valérie Moirod Directrice. The rooms were quiet and comfortable. All the staff we met were efficient, helpful and friendly. Dear Johm L., We very much appreciate your comments regarding your stay at the Hôtel Mercure Toulouse Centre Wilson Capitole. It is always a pleasure to receive positive feedback. I will share your comments with our team. I am sure that this feedback will serve as an encouragement to all of our staff as we strive to continuously improve the quality of our services. Thank you again for sharing your experience, and we hope your next visit will be as pleasant as the previous one. Sincerely, Valérie Moirod General Manager. Hotel is nicely located, the rooms are fine and clean. My room 104 was good, but has a view of the outside breakfast area - this time of year was OK as it was empty, but had this been summer I would have requested a move due to privacy. Dear Guest, Thank you for the great review of our hotel! We are glad that you enjoyed your stay and hope to see you again very soon. Sincerely, Valérie Moirod General Manager. Dear Derek M., We very much appreciate your comments regarding your stay at the Hôtel Mercure Toulouse Centre Wilson Capitole. It is always a pleasure to receive positive feedback. I will share your comments with our team. I am sure that this feedback will serve as an encouragement to all of our staff as we strive to continuously improve the quality of our services. Thank you again for sharing your experience, and we hope your next visit will be as pleasant as the previous one. Sincerely, Valérie Moirod General Manager. Staff were very friendly and helpful. The room was very comfortable and clean but quite small, only just enough room to walk around the bed. There was not much choice on room service and, as I was busy working in the evenings, I did not want the inconvenience of having to go and eat elsewhere. However, great choice and good quality food at the breakfast. An immersive experience. Comfort, great food, wonderful architecture and teargas! Quite wonderful - we'll be back! Dear Simon L., We very much appreciate your comments regarding your stay at the Hôtel Mercure Toulouse Centre Wilson Capitole. It is always a pleasure to receive positive feedback. I will share your comments with our team. I am sure that this feedback will serve as an encouragement to all of our staff as we strive to continuously improve the quality of our services. Thank you again for sharing your experience, and we hope your next visit will be as pleasant as the previous one. Sincerely, Valérie Moirod General Manager. Good room and very good breakfast. The room was comfortable and the breakfast was very nice with the pleasant staff. I like very much overall. Dear Keiichi U., We very much appreciate your comments regarding your stay at the Hôtel Mercure Toulouse Centre Wilson Capitole. It is always a pleasure to receive positive feedback. I will share your comments with our team. I am sure that this feedback will serve as an encouragement to all of our staff as we strive to continuously improve the quality of our services. Thank you again for sharing your experience, and we hope your next visit will be as pleasant as the previous one. Sincerely, Valérie Moirod General Manager. Dear Guest, We very much appreciate your comments regarding your stay at the Hôtel Mercure Toulouse Centre Wilson Capitole. It is always a pleasure to receive positive feedback. I will share your comments with our team. I am sure that this feedback will serve as an encouragement to all of our staff as we strive to continuously improve the quality of our services. Thank you again for sharing your experience, and we hope your next visit will be as pleasant as the previous one. Sincerely, Valérie Moirod General Manager. Dear Guest, Thank you for taking the time to tell us about your experience at the Hôtel Mercure Toulouse Centre Wilson Capitole. I am sorry that your experience did not meet your expectations; please allow me to express my sincerest apologies. At Mercure, we strive to provide a superior service experience for every customer; therefore your feedback is very important to us. Please rest assured that we are taking the appropriate measures to address the problem and prevent future occurrence. We appreciate your sharing your concerns, and it is our hope that you will give us the opportunity to better serve you in the near future. Sincerely, Valérie MoiroD General Manager.